The development of Light Emitting Diode lantern otherwise known as LED lantern is undoubtedly one of the most remarkable inventions in the recent years. Since its inception, it has gained popularity as the best form of light in today’s competitive market. The reason for this is not far-fetched; LED lantern come with some desirable features that put them in the catbird seat above other lights available in the market. They are durable, compact and portable, just to mention a few of their salient qualities. To crown it all, they are available at budget-friendly prices. We all like them cheap, don’t we? With several brands and models of LED Lanterns available in the market, choosing the best LED lantern to buy can sometimes be an uphill task. The questions on prospective buyer’s mind are: How do I know the best LED lantern to buy? What features should I look out for? 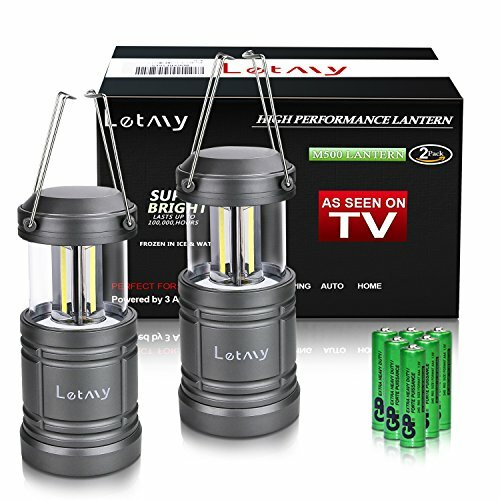 Are these lanterns really worth their prices? The good news is, the answers to the questions are just a few lines away. This article contains information on the top 9 best LED lanterns available in the market, their salient features and why it is a must-have for every home. That’s not all, it also includes a detailed buyer’s guide that will assist you in choosing the most suitable LED lantern for you. This Ultra portable LED lantern produced by Etekcity was designed to last up to a minimum 12 hours. It comes with 30 individual 360° LED bulbs which make it suitable for both indoor and outdoor use. This water-resistant lamp was built with military grade materials, which make it more durable. You can adjust the brightness adjust easily by pressing the dimmer button to make it fit for camping, power outage or during an emergency. This lightweight lantern can be carried on the go with ease. It is collapsible into a smaller size, when the lantern is not in use. The lantern is compact and takes very little space. 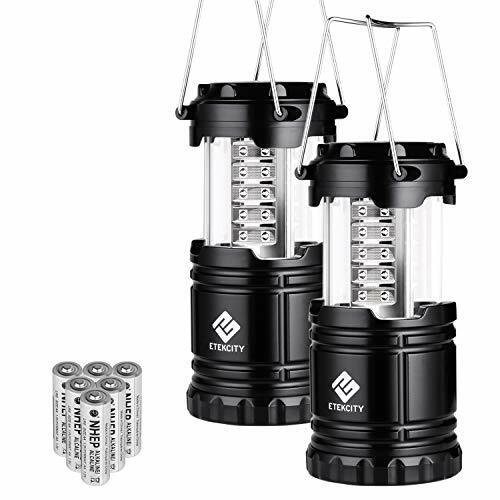 This Etekcity lantern also comes with foldout handles that make the lantern easy to hang. To crown it all, Etekcity give 10-Years warranty to protect against manufacturer’s defect and workmanship. This nicely designed lantern comes with a lot of desirable features and provides the brightest LED lighting in its class. The LED bulbs have an output of 600 Lumens and they can last for 10000 hours. It has a lightweight shockproof design and water resistance capacity. You can easily find it in the dark because the small green LED on the front blinks every 30 every second. It has 3 lighting modes, which you can easily swap to meet your needs. Its battery can last for 6 days. With this, you won’t be buying any other lantern soon. This LED lantern lives up to its name. It is the brightest lantern for its size. Hand-built with military grade, water-proof plastic, it is durable and rugged. This incredibly bright camping lantern was designed to be super lightweight and compact. It is a suitable lamp for both indoor and outdoor. Owning a camping lantern takes your camping experience to a whole new level. It is a perfect gift to buy for your loved ones. It also comes with 15 -year guarantee. Although Streamlight siege may not be the cheapest on the market, it is well worth the price. This well-thought-out design is lightweight, durable, waterproof and it floats. It comes with five C4 LEDs, only one of them is white, the rest are red in color that helps to preserve night vision. Super bright white (Low / Med / High) that can last for 294 hours when it is in the low light mode. The D rings that are located on the top and the bottom of the lantern makes it easy to be hanged or inverted. You can use the texture grip handle to lock it in upright or stowed position. That is not all, its flashing modes is better than that of most other lanterns that just strobe. This amazing lantern is an excellent emergency power outage light to have for good illumination. The lantern’s durable housing is weather-resistant, which make it suitable even in wet and windy conditions. This Lantern boasts two ultra-bright LED bulbs with customizable brightness settings ranging from high to ultra-low. On a high setting, the LED bulbs illuminate for up to 15 hours and has a run time of 150 hours when it is on a low mode. Also, the bottom base of the lantern unscrews to access battery compartment – no tools required. Therefore, you can easily replace the eight D-cell batteries anytime, anywhere. To cap it off, it comes with a 5-year limited warranty. This detachable four in one design is ingenious. The removable sections can be detached, and each of the panels can be placed at the corners of your tent to provide better illumination. In case of emergency, you can remove one of the lights from the base and use it as a personal flashlight. Once the removed panel depletes its battery, hook it back to the main body and it recharges itself. Is that wonderful? In addition, it is water resistant, this makes it suitable for any weather condition. This fantastic lamp features 190 ultra-bright Lumens, powered by 8 D-cell battery. The lantern battery has a long lifespan, and can last for up to 75 hours. The 24 cool-running LEDs are safe to touch and there is no need to replace the LEDs as they can last for a lifetime. 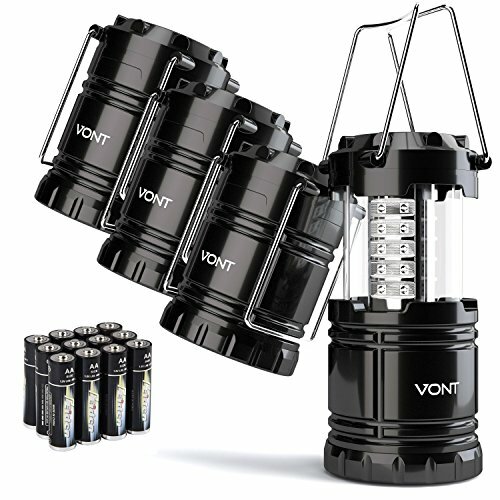 It comes with easy-carry handles for the lantern and each panel. Are you tired of those bulky, dim, battery draining flashlights that hardly work? This camping flashlight is specially designed for you. It features 360° 146 Lumens to give you peerless illumination even in the darkest night. Made of military grade material, it is water resistant, which makes it suitable for any weather condition. It is collapsible into a small bundle for easy control and storage. With over 100,000 hours of LED bulb lifespan, it is preferable to candles, flashlights, kerosene and campfire. A terrific camp light that will let you have a great outdoor experience. With this compact LED lantern, you will never be lost in the dark. This well-thought-out design features trio of COB LEDs, which illuminate in all directions –360 degrees. This rugged lantern was designed to withstand harsh weather condition. Produced with military grade ABS material, it can resist shock and water. 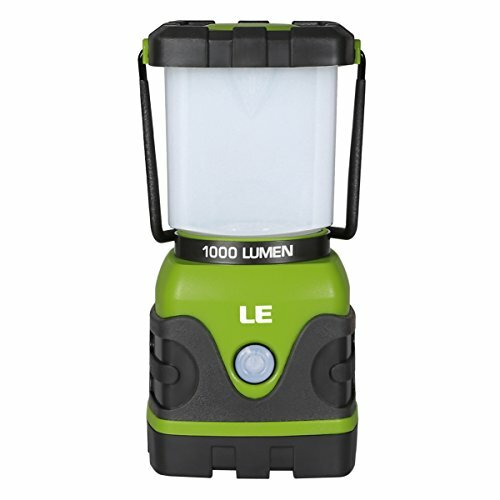 This compact and lightweight lantern can easily be stored in a backpack or you carry it about. It uses the cheap AA battery type. It is an excellent choice to light up a tent, boat or caravan with ease. You can also use when in case of a power outage or during Halloween event. This well-built lantern is super-bright, lightweight and compact. It boasts 800 lumens output good enough to completely illuminate a trail or campsite. This rugged lantern was designed to be durable and water resistant, so it can be used under any weather condition. The lantern can illuminate for a minimum of 5 hours non-stop. The sturdy base is made of plastic and it can stand on any surface-even slippery surfaces. 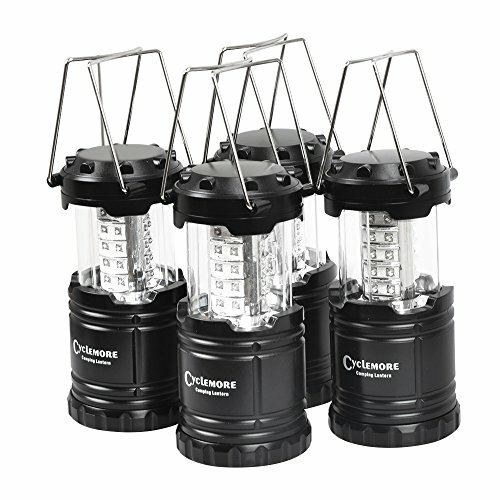 The lantern comes with 4 modes which can be switched to extend runtime. A go-to lantern in case of emergency or power outage. You don’t need to worry about manufacturer’s defect and workmanship because the lantern come with a rare 5-year guarantee. 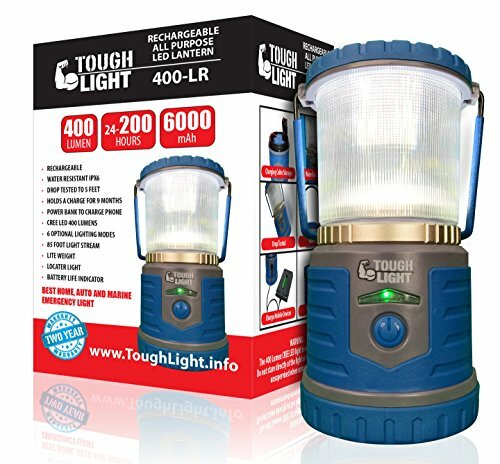 Why am I buying a LED LANTERN? How do I plan to use the lantern? Will I be using it indoor or outdoor? The answers to these questions will be an eye-opener and guide you on the features you need to look out for when deciding which LED lantern is the best for you. Unlike incandescence bulbs whose brightness are measured in watts, the light output of LED lantern is measured in lumens. The lumen indicates how large the area that the lantern can illuminate. The more the lumen, the larger the area the lantern can light up. 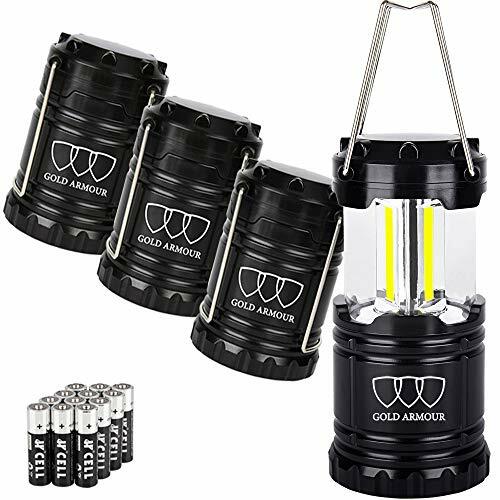 Therefore, it is one of the most important things to consider before deciding on which LED lantern to buy as this will save you a lot of money in the long run. Imagine the LED lantern you relied upon dying when in the dark walkway or in an emergency, that is a very dreadful experience. Therefore, you need to choose a lantern that is reliable and can last for a very long time. Thankfully, most LED lantern batteries have an impressive lifespan of up to 300 hrs and 3 hours run time is its bare minimum. Before you buy a LED lantern recharged by the sun, keep it in mind that their battery lifespan may be shorter as they can’t charge without the sun. This is probably the first features people consider why buying any lamp. Nobody what to end up with a dazzling light, the type that blinds and can only be used for security purposes. Dim light is not any better either; therefore, you have to look carefully for the one that suits your needs. Don’t confuse brightness with lumen, although they are related, they are two different things entirely. Brightness is a measure of how gleaming the light a lantern emits is. On the flip side, lumen indicates how large the area the light can cover. We all want to save ourselves the punishment of carrying a short put about as a lantern. Heavy lantern is not suitable for camping. Camp lovers prefer lightweight and portable lantern because they will be carrying other things as well. Nobody like a delicate lantern that crumbles at any chance it gets. As with brightness, you need research and find a balance between heaviness and sturdiness before choosing the best LED lantern to buy. However, this does not matter if you plan to hang the lantern in a fix position and not move it about. People consider LED lantern better than their alternatives because they are very easy to operate. People don’t like complicated tools, who have the patience to frolic with a lot of buttons just because they need light. 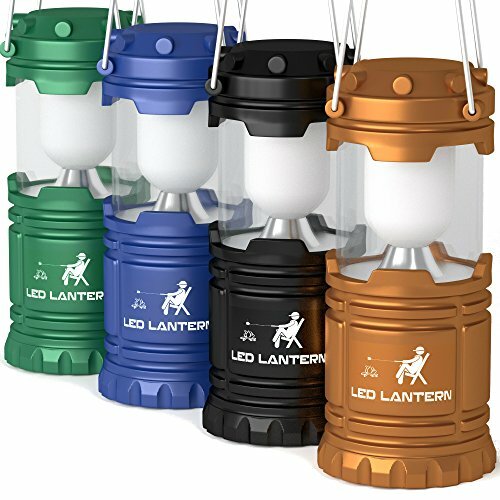 I suggest that you buy a lantern that comes with just on/off switch, and not those with complicated setting unless it is necessary you have one. How much are you ready to path with to acquire your desired lantern? Remember, you need to cut your coat according to your cloth. Carefully go through the options and choose the one that falls within your budget. I hope the information contained in this article has helped you in finding the best LED lantern that suit your various needs. Get a LED lantern today and kiss darkness goodbye forever.